← First review in! Premier compte-rendu! This paper argues that Rinaldo and Armida, a ‘dramatick’ opera by John Dennis and composer John Eccles, utilised and indeed promoted the imagery of Williamite myth- making. The opera was partly based on Armide (1686), the hugely successful tragédie en musique by Philippe Quinault and Jean-Baptiste Lully, and also more generally followed the Armida/Rinaldo romance in Tasso’s Renaissance epic Gerusalemme liberata (‘The Liberation of Jerusalem’ – available in English translation by 1600). 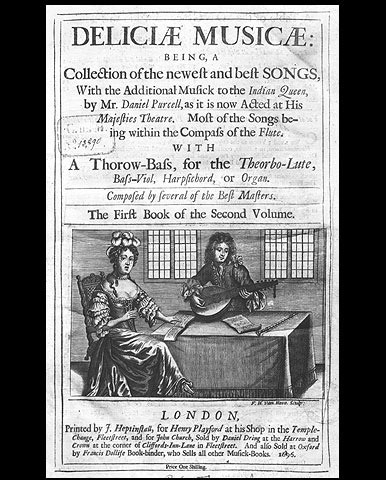 Adaptations formed an important part of the post-Commonwealth theatrical repertory, and William Davenant’s Shakespearean adaptations in the 1660s (notably Macbeth, and The Tempest, or The Enchanted Island) also contributed to the development of dramatick opera on the English stage. It was not unknown for well-known narratives to be re-formed for the theatre in ways that could be interpreted politically. 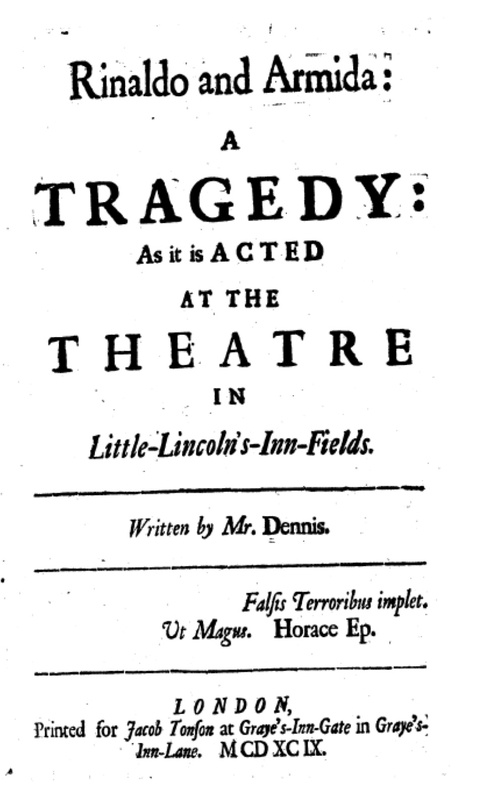 This was especially so during the Exclusion Crisis of the 1670s and early ’80s, a case in point being Nahum Tate’s ironically now-infamous happy-ending version of King Lear, produced in 1681. The Lear and Cordelia of that production, Thomas Betterton and Elizabeth Barry, serve as a useful link; seventeen years later we find them still together, this time as the title lovers of Rinaldo and Armida. Its story of the crusader knight Rinaldo being lured by, but eventually escaping, the Saracen enchantress Armida – in Tasso’s richly allusive epic – was already popular. Evoking Odysseus and Circe, or Dido and Aeneas, from classical literature, Armida and her magic function as the main obstacle to Rinaldo’s eventual achievement of glory and virtue, which in turn serves as a microcosm for the victory of the Christian faith over both its own divisions (the poem was in part a product of the Counter-Reformation) and the pagan infidel. 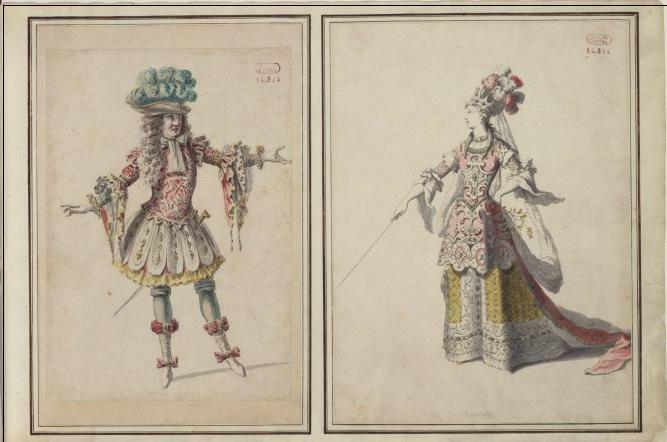 Popular at the French royal court, this romance was used in ballets as early as 1617, but the tale was most famously re-staged in 1686 as Armide, the final fruit of the partnership between writer Philippe Quinault and composer Jean-Baptiste Lully. Revived in Paris as many as three times, most recently in 1697, if London audiences in 1698 had any sense of this romantic story as a stage work it would surely have been in this context. Secretly Sliding into Hero’s Hearts. Dennis purposely adapts Tasso’s characters to suit the morality with which he invests the drama. Armida, shorn of the moral ambiguity that makes her such an arresting character in the texts of both Quinault and Tasso, becomes a tragic heroine who ultimately suffers and dies – arguably evoking the female protagonists of the so- called she-tragedies with which actress Elizabeth Barry was especially associated. If the clear separation of good and evil on the stage was considered necessary to ensure political and social order, then Dennis’ adaptation certainly matches that aim. 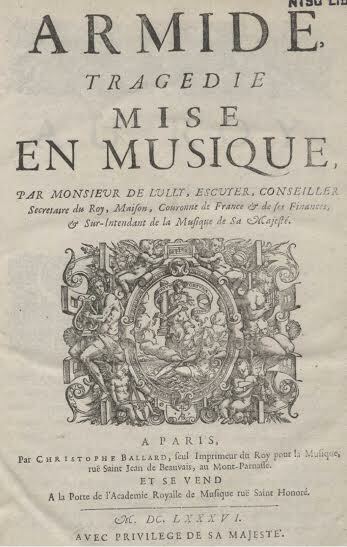 Literature, whether printed or performed, played an important role in the cultural conflict between France and England, with the differences between French absolutism and English constitutionalism played out in such works as Charles Montague’s panegyric ode An Epistle to the Earl of Dorset (1690). Written after the defeat of Louis XIV’s allies at the battle of the Boyne, the poem’s didacticism underlined a self-awareness of styles of praise within the poem, as Montague satirically imagines if William III were French – “Opera’s [would] repeat no other Sound; / Boyne wou’d for Ages, be the Painter’s Theam…” Indicating the relationship between policy and poetry in Whig culture, Montague, as one of the earliest identifiably ‘Whig’ writers, by contrast praises William III and his generals not as exemplary symbols of heroic fame, but rather as the implied guarantors of English liberty, the Whig aesthetic only accepting the trappings of absolutism ironically. Similarly, in Rinaldo and Armida music may well charm, but it is ultimately passed over in favour of the plain speech of victory, with this adaptation turning a symbol of France’s cultural fame on its head. Michael recently completed a PhD in early opera at Queens University Belfast. His academia page can be found here.